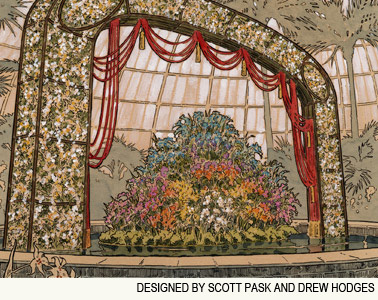 Experience the thrill of opening night at The Orchid Show: On Broadway as Tony award-winning set designer Scott Pask and image-maker Drew Hodges bring the allure, excitement, and glamour of Broadway to The New York Botanical Garden. This must-see, limited run horticultural engagement takes place in the dramatic galleries of the landmark Enid A. Haupt Conservatory. Echoing elements from some of Broadway's most iconic theaters, including the Walter Kerr Theater and the New Amsterdam Theater, The Orchid Show: On Broadway showcases 5,000 dazzling specimens from one of the most distinguished orchid collections in the world. Monday, April 25, 10 a.m.-6 p.m.
Closed most Mondays and Christmas Day. Please confirm hours on the day of your visit by calling 718.817.8700. Take the Metro-North Harlem local line to Botanical Garden Station. By becoming a Member today, you'll not only get a whole year's worth of benefits, you'll get the knowledge that you are helping the Garden's renowned horticulture, science, and education programs to flourish. The Adams Landscaping crews design and install an amazing backdrop of patios, ponds and walkways for hundreds of flowering spring bulbs, annuals, trees and shrubs. Vendors, knowledgeable staff and garden experts from throughout the region are there to answer all your questions. The Garden Show is free to attend and also includes seminars, giveaways and raffles for great prizes! Once again, it is time for your company to make plans for the Tri-state’s premier one-day trade show, NEW JERSEY LANDSCAPE 2011, on Wednesday, March 2, 2011. Eight hours of intense exhibiting and selling will begin at 8:30 a.m. and end at 4:30 p.m. So, get your exhibit booth organized and get your sales teams ready to handle over one thousand of Green Industry professionals who will crowd the aisles of the Meadowlands Exposition Center in Secaucus, New Jersey. As part of your company’s trade show planning, you should consider post-show marketing. One effective way to have your company name and products remain with attendees after the show is to advertise in the NJL 2011 BUYER’S GUIDE exhibitor directory. This handy booklet will include a complete listing of all the exhibitors, a list of Green Industry associations, valuable business information, and advertising space for your company. If you would like to participate in these programs, please fill out the enclosed form(s) and return with your check by February 1, 2011. Remember, we will give the BUYER’S GUIDE to all attendees as they enter the exhibit hall. Thank you for past support and we look forward to seeing you at the show. In 2011, we expect to offer over 60 varieties of locally grown seed and around 100 varieties sourced from responsible seed houses. Most of our varieties are rooted in the history and soils of New York or are chosen because they do well here. Every year we plan on growing additional varieties on the Seed Library farm and contracting with organic and certified naturally grown farmers in the Hudson Valley and upstate New York to grow even more varieties. Our membership program provides a way for backyard gardeners to make a vital contribution to this effort. By 2014, we aim to be 100% New York grown, though certain tricky biennials may be holdouts for a few years beyond. Who are the people behind the Seed Library? The farm and business are run by partners Ken Greene (on right in photo) and Doug Muller (on left). Our friend Linda-Brook Guenther of Back to Basics helps us regulary with seed-packing, organizing, order processing, and farm work. We are often helped by other folks, including Erin Enouen of Second Wind CSA, Nancy Campbell Muller, Aileah Kvashay, Jacinta Bunnell, Carrie Schapker, Michael Asbill, Peg Lotvin, and lots of other good people in the Hudson Valley. We offer three different types of seed packs. Our Art Packs are each designed by a different artist from the greater New York region (this includes upstate New York, the Hudson Valley, the City, Northern New Jersey, and Connecticut). Each pack celebrates the beauty inherent in heirloom gardening. Click here to see all the art packs and to learn more. Our Library Packs contain seed that was grown by member farmers and gardeners. We grow most of this seed at our own farm in Accord, New York, and we are helped by about fifteen farms that are part of our seed-growing network in the Hudson Valley. Our Garden Packs contain seed that was obtained from wholesale seed suppliers. 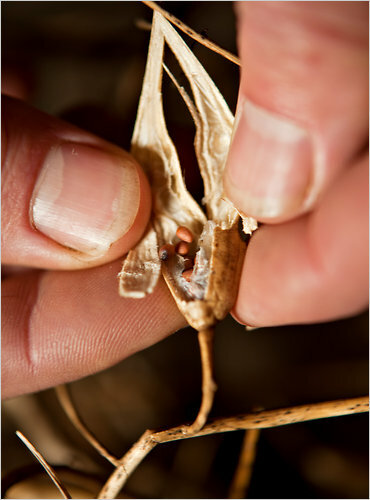 We do not source seeds from companies owned or operated by corporate biotech interests. Over the next several years we hope to dramatically decrease our reliance on outside suppliers in favor of seed produced on our own farm and by local growers. Winter may be fast approaching but verdant greenery abounds in Gardens of the Hudson Valley, a new photographic portrait of the region's lush private landscapes. The luxurious volume chronicles 25 gardens chosen to give "a sense of place and convey the romance of the landscape" abutting the majestic Hudson River in New York state. 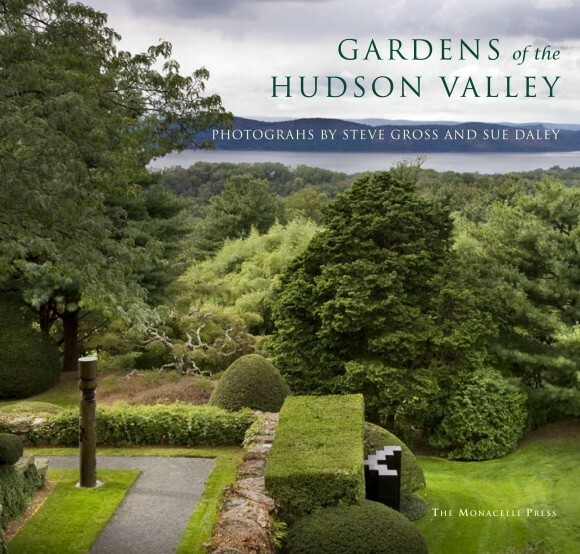 Photographers Steve Gross and Susan Daley selected gardens from Yonkers up the river to the town of Hudson, including famous formal estate gardens like Kykuit, Boscobel, the Vanderbilt Mansion, and Olana, along with smaller, more naturalistic plots that combine sweeping views and lush plantings. Each of the gardens tells a story about the people who made them, and collectively they evoke "the grace and grandeur of the Hudson River landscape" underscoring the central role the Hudson Valley played in the birth of an American garden tradition. 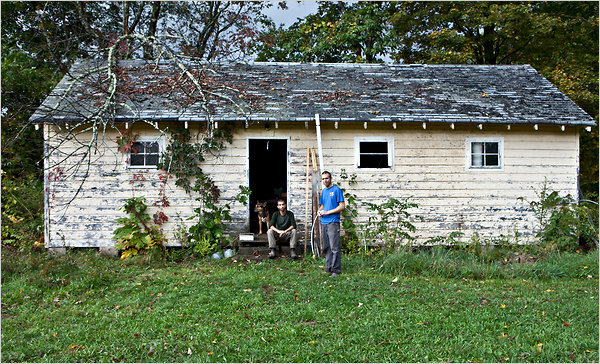 The Hudson Valley Seed Library and its founders Ken Greene, seated (with the dog, Kale), and Doug Muller. The Hudson Valley Seed Library’s members save the seeds from the heritage crops they grow. EARLY one morning a couple of weeks ago, I helped Joan Dye Gussow, 81, lug three bags of topsoil to the riverbank, before it became too hot and humid to work in her garden, which sweeps down from her house to the Hudson River. It was hard to get a grip on the heavy plastic bag, but Ms. Gussow, a nutritionist and matriarch of the eat-locally-think-globally food movement, is amazingly sturdy for an octogenarian, and she marched me down the wide clover path toward the river. “It likes being walked on,” she said of the white clover, as we trudged past her tomato cages full of ripening San Marzanos and Sungolds, self-seeded rainbow chard, sweet potatoes, newly planted peas, Malabar spinach and many other vegetables that make up Ms. Gussow’s year-round food supply. More than 35 years before Fritz Haeg started his Edible Estates: Attack on the Front Lawn project in 2005 — his effort to turn the country’s lawns into vegetable patches — Ms. Gussow and her husband, Alan, an artist, were already in that mode. They laid down trash, kitchen waste and weeds, covered with newspapers and salt hay (killing the grass and making compost at the same time) on the front lawn of their Victorian in Congers, N.Y. Their goal: to grow food for themselves and their two young sons, Adam and Seth. They farmed that lawn for more than two decades before moving here, to do the same thing, in 1995. Ms. Gussow had gone back to school in 1969 to earn a doctorate in nutrition at Columbia University, at a time when nutrition was all about vitamins and chemistry, not how food was grown and where it came from. She began connecting the dots between what Americans were eating and how that food — be it factory-farmed chicken or Twinkies — was produced. She created a legendary course, Nutritional Ecology, which she still teaches today, with a former student, Toni Liquori, who as director of School Food Focus, a nationwide program, works with school districts to buy more healthful, locally grown food. Because Ms. Gussow dared to talk about energy use, pollution, diabetes and obesity as the true costs of food, she was initially viewed as a maverick crank, but her connections inspired the work of people like Michael Pollan, whose book “In Defense of Food,” echoes many of her revelations. Ms. Gussow’s thinking, like Mr. Pollan’s, has always been grounded in the garden. That muggy morning, as temperatures headed for the high 90s, we dumped the bags of soil near the boardwalk, where, only a few feet away, mallards were paddling peacefully in the quiet water. It was hard to imagine that in March a storm had brought the river surging over the boardwalk, tearing up its boards and pilings, ripping raised beds out of the ground as it moved toward the house, burying the long narrow garden — 36 by 100 feet — under two feet of water. The day of the storm, March 13, had been a momentous one: she had finished the revisions to her new book, “Growing Older: A Chronicle of Death, Life and Vegetables,” published by Chelsea Green, and due out in November. And for the first time in her long writing life — she has written, co-written or edited five books — she was about to get an advance. The morning after, finding herself blocked by the debris of what used to be raised beds and the boardwalk, she went inside to call Dave Avdoyan, the landscaper who had built the boxes for those beds, as well as a low stone wall on the north side of the garden, which in recent years had blocked river water rising in a storm. Now it, too, was submerged. She figured her plants, including her beloved fruit trees and azaleas, were a total loss. But Mr. Avdoyan surveyed the wreckage, looked over the fence at the empty lot next door, which had better drainage and wasn’t as flooded, and proposed a radical solution: using the lot as a staging area and trucking in enough fill to raise her bathtub of a garden two feet. Over the next few weeks, friends from the city picked up lumber, and a neighbor stacked bricks and pavers from the paths on the boardwalk. Former students helped move hundreds of plants, stashing them in the driveway, on the deck, any corner they could find. Mr. Avdoyan and a helper rebuilt the boardwalk and friends replaced the filter cloth behind the rocks to keep soil from washing out with the river. Then, on March 30, a high tide flooded the garden again. Another week went by, and finally, Mr. Avdoyan set to work with his Caterpillar, forklifting plants like the still-blooming peach tree, the low ilex hedges and the azaleas right out of the ground, and trundling them over to the empty lot, where they were set in mounds of donated soil and compost. After Mr. Avdoyan trucked in 200 yards of fill, a crew of 17 staff members from Stone Barns Center for Food and Agriculture, in Pocantico Hills, N.Y., came down to spread 30 yards of soil and compost from McEnroe Organic Farm, in Millerton, N.Y., donated by Helena Durst. Then they laid down pavers and bricks for walkways that now lie flush with the vegetable beds. “I’m so happy the wood is gone — it wasn’t pretty,” Ms. Gussow said, referring to the planting boxes, as we walked down the cross paths, admiring her crops. “It was a lot of work,” she said, recalling how she singlehandedly repotted hundreds of plants, including precious lily bulbs. I loved the soft, wide path of white clover, which rarely has to be mowed, and made a mental note to plant one in my own garden. Ditto for the perennial arugula, which was thriving beneath the trifoliate orange tree given to her by Barbara Kingsolver, who also lives off the land. The arugula, which returns year after year, was given to her by Larry Bogdanow, an architect and gardener, at the Just Food benefit held at Sotheby’s on April 25, where 300 locavores toasted and roasted Ms. Gussow, as the mother of their movement. Other flood victims were thriving here as well: The kiwi vines, lifted out of their root-bound urns by the flood, are now climbing their trellis. The peach tree, relocated in a sunnier spot, bore 75 peaches in late June. I had been in this garden in 2001, when Ms. Gussow’s first memoir, “This Organic Life: Confessions of a Suburban Homesteader,” was published. That book chronicled the constant floods and the battles with woodchucks and neighbors that she and Alan had begun waging six years earlier, when they moved into their 150-year-old house, a former Odd Fellows Hall that sat right on the street. But its backyard faced east, toward the sunrise, and ran right to the river. The house turned out to be so rotten they had to demolish it and rebuild. Alan had only two and a half years to enjoy it before he died of cancer, in May 1997. 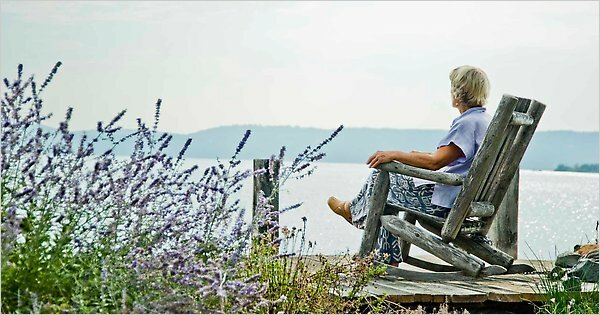 “Growing Older” picks up that story, beginning with Ms. Gussow’s revelation that, to her surprise, she did not miss her husband, or even grieve for him. “I kept experiencing it as a strange liberation from things I hadn’t known I was imprisoned by,” she writes. Such honesty is characteristic of Ms. Gussow, whether she is discussing intimate relationships or the one the United States has with oil. And here we stood in her garden, which was simmering in a week of high humidity, with no rain. The morning news had told of wildfires burning up the forests in Russia, and of hundreds of people dying from the heat. We came inside, because it was too hot to work, to make a breakfast of those luscious Marzanos, simmered in a little oil and cumin, and eggs. Her hero is Bill McKibben, the environmental activist whose latest book, “Eaarth,” will be a key text in her course at Columbia this fall. Every year, she tries to prepare her students for the despair they inevitably feel as they consume the readings she has compiled on the world’s population, poverty, hunger, pollution, disease, loss of habitat and farmland, melting ice caps, oil spills and the like. “All you can do is say: ‘You can’t be optimistic about the state of the world — what you can be is open-minded. You’re going to look for solutions, and you’re going to make your own life mean something. You can no longer think that accumulating money or the biggest house is the answer,’ ” she said. She is encouraged by all the young people going into agriculture. Ms. Gussow figures she has a good 20 years, at least, to garden in this watery paradise. But time is finite. HERE are some tips for vegetable gardeners from Joan Dye Gussow. Make your own sweet-potato slips by suspending a sweet potato, speared with toothpicks, over a glass jar filled with water. It should form roots in a week or so and begin sprouting from the top. If it doesn’t, turn it upside down; roots will grow from the bottom and the top will sprout. When sprouts have leaves, snap the shoots off at the base and root in a glass of water. Keep woodchucks, rabbits and other varmints out of the broccoli and cabbage patch by placing a piece of construction wire, curved in a hoop, over the plants, along the length of the bed. Add a layer of chicken wire. The mini-hoop house offers support as plants like brussels sprouts grow, and critters cannot get to tempting crops. Use 16-inch-square pavers, edged with brick, to make a path two feet across, wide enough for walking or rolling a wheelbarrow. The path gives a crisp look to the crops in the beds on either side, which, in Ms. Gussow’s new garden, are now flush with it, not raised and edged with wood. Ms. Gussow used to start her own chilies, eggplants and tomatoes from seed, but now she orders plants from Cross Country Nurseries (908-996-4646, chileplants.com), in Rosemont, N.J. The company ships live plants nationwide from April through June, and fresh chilies from September to frost. To preserve chard, de-stem the leaves, then roll them up to julienne and lightly sauté. Put cupfuls on a tray and freeze. Place frozen cupfuls in a plastic bag, and stash in the freezer, to be used as needed. it's finally spring! What a relief, after these past six weeks of gloomy, stormy weather — can we talk about that groundhog now? Here's to the return of electricity for nearly all of us and a look ahead to a glorious season, hopefully, of warm days and pretty flowers. o help us plan our gardens, we turned to Noah Schwartz, the head grower and greenhouse manager at Matterhorn Nursery in New Hempstead, and asked him for a top 10 list of new plants that will be arriving in local garden centers in coming weeks. In 2006, Schwartz was named Young Grower of the Year by GrowerTalks, a trade magazine for the nursery industry, and he oversees the plants at one of the largest and best-known nurseries in the Hudson Valley. Having worked with Schwartz over the years and having seen his own garden in Congers, we know how much he loves color, lots of it — and the hotter and bolder the better. So it's no surprise, really, that eight of his picks are brightly colored annuals that promise to bloom their heads off all summer. Most annuals can't take a late-season frost, so be careful about planting them outside before Mother's Day weekend, the traditional start of the Lower Hudson Valley gardening calendar. Without further ado, here are Schwartz's winning plants for 2010, in no particular order. Hydrangea arborescens 'Invincibelle Spirit'(grower: Proven Winners). This new hydrangea has been getting lots of attention in the nursery trade. People are calling it the first pink 'Annabelle' hydrangea, an old-time favorite with huge white blooms. 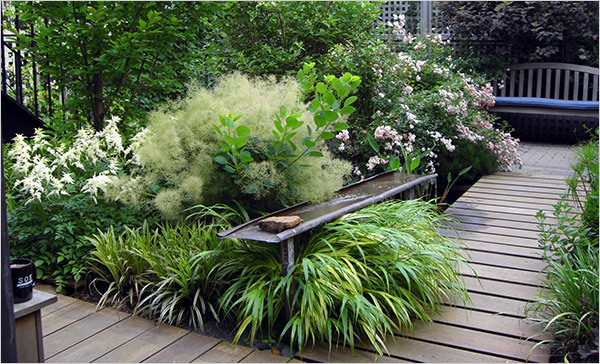 "It's a great plant for containers as well as out in the landscape," Schwartz says. "It has great flower power." 'Invincibelle Spirit' features bright pink blooms that grow on new wood, so it will still produce flowers if the shrub suffers winter damage. It will keep flowering all summer, right up to a hard frost. egonia boliviensis 'Bonfire' (Anthony Tesselaar). Unlike other begonias that prefer cool, shady spots, 'Bonfire' can take heat and full sun and still bloom from early summer till frost. Fully half of the plant should be covered with blooms for most of the summer. It produces masses of pendulum-shaped, orange-red flowers that spill out of containers and hanging baskets. It was introduced about four years and remains one of Schwartz's favorites. "It's still the best series out there," he says. "I think it's still underused." Euphorbia 'Breathless Blush' (Ball Horticulture). This heat-tolerant new annual is similar to the popular 'Diamond Frost' euphorbia that was introduced a couple of years ago, but it has red-flushed leaves and pinkish flowers instead of white. It has a tight, mounded growth habit and stays fairly small — just 8 to 12 inches tall. African marigold Taishan series (Pan American Seed Co.). After a limited release last year, this highly floriferous dwarf marigold will be widely available this spring. It comes in two colors — gold and orange. "I'm almost embarrassed to say I love a marigold," Schwartz says. It will do OK in a container, he says, "but it does best as a bedding plant — then it's just fantastic." Gomphrena 'Fireworks' (Pan American). This new globe amaranth features hot pink blooms tinged with yellow that sit atop strong, tall stems. Give this guy room to grow. "It got to be 4 feet tall in my garden," Schwartz says. "It's quite sturdy in the landscape." This fiery annual "continues to flower and flower and flower," he says. "It really doesn't need to be deadheaded and it's great as a cut flower." Lantana 'Lucky Sunrise Rose' (Ball Horticulture). Here's another brightly colored annual that loves the heat and does particularly well in containers. Butterflies and hummingbirds love lantana. Petunia 'Rhythm and Blues' (Ball Horticulture). This showy new exclusive from Home Depot offers deep blue blooms with white edging. "Each flower is exactly the same," Schwartz says. "It's very consistently colored." It's more compact and less aggressive than the popular Wave series of petunias, he says. Geranium 'Calliope Dark Red' (Syngenta Flowers). What's not to love about an old-fashioned velvety red geranium? "It has a semicascading habit, so it looks great in containers and baskets," Schwartz says. "It sends out a lot of flowers, with nice dark green foliage." It's easy to find, too. "It's pretty much available everywhere," he says, including Home Depot, Lowe's and Costco. Petunia 'Pretty Much Picasso' (Proven Winners). We'll end with an annual that features blooms in the typically wild color combinations we've come to expect from Schwartz — violet interiors and chartreuse edges, with dark purple veins radiating from the center of each flower. "It's such a novelty," he say. But it gets a little floppy, so grow this hot little number in a container or hanging basket. We've been planting and planting and moving tender plants in and out all spring, andwe finally took a moment to step back and look at what we have - We are thrilled to report that the seedlings and plants are looking gorgeous! This is going to be our best plant sale ever - we have tons of beautiful broccoli, cauliflower, cabbage, collards, chard, and other greens that are excited to go into the ground! Our celery, fennel, parsley, cilantro, radicchio are just perfect. We are offering some new combos this year - a Mustard Green Quartet of Varietiesand an Heirloom Kale Trio. We specialize in Companion and Dynamic Plants and have a full assortment for you to choose to boost your veggies' production power! We also will have tomatoes, peppers, cucumbers, squash, and eggplants that will need to wait a bit to get in the ground, but they are timed to be the perfect size to plant after our last frost date. We have all sorts of new varieties as well as the old favorite heirlooms. I am most excited by the Aunt Ruby's German Greens and the Black Krims. This year our most exciting pepper is a black-colored chile pepper called Chile Pasilla Bajio - a black long chili - I can't wait to see what they look like growing! And we will have Genovese basil, Large leaf basil, Thai siam queen basil, Purple opal basil, Lime and Lemon basil, and of course - Holy Basil or Tulsi. As you can see, we are really excited about getting growing and about offering these organic and biodynamic plants to all of you. Nothing is healthier or more life-affirming than eating from your own garden, and we are so happy to be a part of that! Thank you for all of your support of our farm, and we are eagerly looking forward to seeing you Saturday! Our obsession has always been herbs and so beyond vegetables, we are so proud of our huge variety of herbs - culinary and medicinal - everything from Angelica, Basil, and Coltsfoot to Uva Ursi, Valerian and Yarrow (sorry, we have no herbs that start with X or Z). We're planning to set them up in alphabetical order this year, which I think will help people find what they are looking for, and I think it is just so fun to see the herbs you might be using medicinally as they are in life. We will have plenty of new and rare stuff for the herb collector! English, Red Creeping, French, German Winter, Varigated Lemon, Highland Cream, Woolly (so cute! ), and Orange-Balsam. The Gotu Kola are doing splendidly, in case you were wondering! And for the Foodie and Cook, we have absolutely the best Tarragon and Chervilthis year! And don't forget that every garden needs parsley! We also will have tables set up of Native Plants and Pollinator-Friendly Plants which will include such things as Butterfly Weed, Lysimachia, and Yarrow for the Butterfliesand Hyssop, Mint, and Bee Balm for the Honey Bees. We will also have New York Aster, Cardinal Flower, many different Monardas, and a shimmering mix of herbs that bees and butterflies will love! And to continue my obsession, we will have a lovely variety of Shady Ephemeral plants including various ferns, Black Cohosh, Lily of the Valley, Liverwort, and Bloodroot. And we are proud to say that we have some VERY hard-to-find stuff that we have been hunting down and finally got a hold of and can offer to you! I finally found seed for this plant offered by a small seed company called Diane's Seeds. I am so happy with how they germinated and they are doing fabulously. You will really love this beautiful sage! It is another sage - but of a whole other type - this is the almost-mythical ultimate culinary sage - it is supposed to have the best flavor of all the sages - I cannot wait to try it! You won't find anyone else on the East Coast with this sage! Not really grown for flavor, it is a stunning hanging variety of oregano with pink and green bracts. Awesome combined with Dotted Mint or Monarda Punctata! Lavenders - Two English Hardy Varieties this Year! We are offering two English Hardy Lavenders - Munstead with a magenta-purple flower head and Hidcote Blue with a blue-purple flower head. Both smell wonderful and can make it through the winters around here! Although we always feel frivolous, we can't help ourselves but get new and exciting flowers each year. This year, you can expect Bright Yellow Carnations, a variety of old-fashioned Hollyhocks (including the original heirloom French breed that started all the hollyhocks), Walker's Low Catmint, a delightfully-scented Dianthus called 'Fancy Knickers,' and an absolutely frivolous Hardy Hibiscus! We are also two subtle clematis vines - Autumn Sweet and Radar Love. Saucy Seduction Yarrow (Have you noticed that we try a new yarrow each year? Last year was Cloth of Gold; in 2007 we featured next year will be eitherSummer Pastels;Paprika orStrawberry Seduction). Achillea or Yarrow is a dynamic herb and when planted among other herbs, encourages higher essential oil production. And they are gorgeous and addictive! And alwaysEuphorbia - Deer hate it and other plants love to grow near it - particularly plants that like warmth. I just can't wait to see everything taking off around the yard and in the garden! Thank you very much for your interest in Midsummer Farm and in Sustainable and Organic Agriculture! HAPPY SPRING !!! !